As carbon dioxide is pumped into the atmosphere, the oceans absorb much of it, changing the chemical balance of the seawater. The phenomenon is termed ocean acidification and it’s a potential threat for some marine species. Now, the shellfish industry have to combat chemical changes as the water in their hatcheries becomes inhospitable. But Davis has a plan: kelp. Led by the Puget Sound Restoration Fund, Davis and a crew of oceanographers, biologists and chemists started testing kelp’s natural ability to absorb dissolved carbon dioxide in Puget Sound’s water in 2016. They wanted to know if kelp could soak up enough carbon to create a halo of healthy water around areas growing shellfish. Ocean water has remained slightly basic for thousands of years, but in the last two centuries it has begun to increase in acidity. The National Oceanic and Atmospheric Administration projects seawater will be 150 percent more acidic by the end of the century, if carbon dioxide emission rates continue to increase at the current pace. The November 2018 edition covers topic such as land-based coral restoration farm, crabbers suing the fossil fuel industry, the failure of WA’s carbon fee initiative, razor clams, the Global Climate Action Summit, two new Climate Assessments, Arctic OA, and more. The world’s oceans have absorbed 93% of the excess heat from human-induced warming since the mid-20th century and are currently absorbing more than a quarter of the carbon dioxide emitted to the atmosphere annually from human activities, making the oceans warmer and more acidic. Increasing sea surface temperatures, rising sea levels, and changing patterns of precipitation, winds, nutrients, and ocean circulation are contributing to overall declining oxygen concentrations in many locations. The Second State of the Carbon Cycle Report (SOCCR2) provides a current state-of-the-science assessment of the carbon cycle in North America (i.e., the United States, Canada, and Mexico) and its connection to climate and society (see Box 1, What Is SOCCR2?, this page). Information from the report is relevant to climate and carbon research as well as to management practices in North America and around the world. This general overview provides abbreviated highlights of some of the many significant findings from the 19 chapters in SOCCR2. Ocean acidification, or the decrease in seawater pH due to increased oceanic CO2 absorption, can adversely affect many marine populations and ecosystem processes, including organisms that people rely on for food and ecosystem services that sustain economies and cultures throughout North America. Acidification is occurring faster in circumpolar regions and some coastal areas than in the open ocean. For example, over the past decade, Arctic and Pacific Northwest coastal waters have experienced longer, more frequent periods of lower pH, putting livelihoods reliant on these areas at increased risk. Maintaining and expanding existing ocean observing programs, as well as continuing coordinated work with stakeholders, will be critical to ensure a healthier ocean, resilient communities, and strong economies. Corals reefs face double threats from rising atmospheric carbon dioxide: severe heat stress and ocean acidification. Severe heat stress causes bleaching (the expulsion of corals’ food-producing algae). 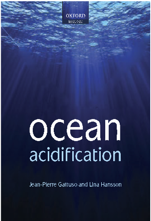 Ocean acidification (the drop in seawater pH as the ocean absorbs carbon dioxide) reduces the availability of calcium minerals for skeleton building and repair. The combination of these two threats poses a Catch-22 for coral reefs. In many cases, the longer a reef is protected from severe heat stress, the more time the ocean has to absorb carbon dioxide, and the greater the threat the reef will face from acidification by that point in time. 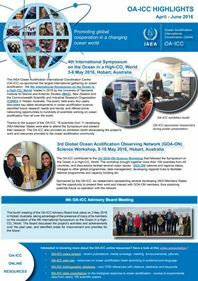 The new edition of the “OA-ICC Highlights” summarizes the project’s main activities and achievements over the period July – September 2018. The content is structured around the three major areas of work of the OA-ICC: science, capacity building and communication. Links to the project’s main resources are also provided. Face à l’insuffisance des efforts mondiaux d’atténuation des émissions de gaz à effet de serre (GES) pour maintenir le réchauffement global « bien en-dessous de 2 °C » (en 2100, par rapport à la période préindustrielle) et ainsi favoriser l’atteinte des objectifs de développement durable des Nations unies, il est critique, aujourd’hui, de relever l’ambition politique tant en matière d’atténuation que d’adaptation des écosystèmes et des sociétés. Dans cette perspective, ce Document de propositions pose la question des opportunités offertes par l’océan pour soutenir l’action climatique internationale. L’océan joue un rôle déterminant dans la minimisation du changement climatique d’origine anthropique (en termes d’absorption de la chaleur atmosphérique et du CO2), mais au prix de répercussions importantes sur son fonctionnement chimique et physique : réchauffement, acidification, désoxygénation et élévation du niveau de la mer. Cela a bien entendu des implications, déjà détectables, sur les écosystèmes et les services écosystémiques. À la fois victime et acteur, quel est le potentiel de l’océan et de ses écosystèmes pour limiter les causes du changement climatique et ses conséquences ? Ce Document de propositions résume les principales conclusions de l’Ocean Solutions Initiative1, qui a évalué le potentiel de 13 mesures fondées sur l’océan.